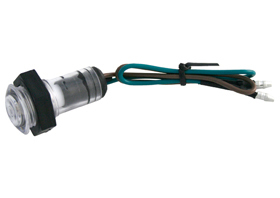 This big 12V custom LED can be used as a driving light on any custom project. These motorcycle parts are made for custom Harley Davidson motorcycles (HD), bobbers, custom choppers, and most custom bikes. Dimensions: binding head diameter 0.90″, thread diameter 0.74″ (18.75mm), housing diameter passed threaded area 0.63″, housing depth passed lens area 1.57”.